Image of Griffis-Duffy platform made by Charles W. Wampler and Douglas N. Arnold using Matlab. A Griffis-Duffy Type I platform consists of two equilateral triangles with moveable legs connecting the vertices of one with the edge midpoints of the other. With the base triangle in fixed position and the leg lengths fixed but angles free, a point attached to the other triangle traces out an algebraic curve of degree 40 in Euclidean 3-space. Algebraic geometry has a long and distinguished presence in the history of mathematics that produced both powerful and elegant theorems. In recent years new algorithms have been developed and several old and new methods from algebraic geometry have led to significant and unexpected advances in several diverse areas of application. 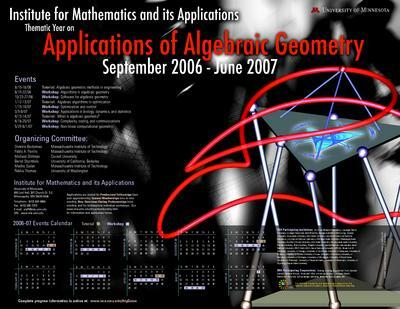 Motivated by these exciting developments, the year in algebraic geometry and its applications aims to bring together mathematicians, computer scientists, economists, statisticians and engineers from various disciplines in order to enhance interactions, generate new applications and motivate further progress. In the first quarter, the two workshops cover algorithms and software with a particular eye towards applications. In the second and third quarter, the workshops cover applications in optimization, control, statistics, economics and bioinformatics, coding, complexity, communications and computational geometry.